A 3rd generation artist whose art career spans 40 years, Emilie Rhys has since October 24, 2011 been prolifically producing original artworks of musicians during live performances around New Orleans. To promote this work, in December 2015 she launched SceneByRhys.com, and then a year later – along with musician Esther Rose as Manager – Ms. Rhys opened the brick & mortar storefront Scene By Rhys Art Gallery, located in a historic 1798 French Quarter building on Toulouse, entered through a large courtyard guarded by two stone lions high up on the street wall. The purpose of this website and the gallery on Toulouse is to celebrate the music and musicians of New Orleans via the public display and sales of this artwork showing one very unique view of the local music scene. Originals range in size from 5"x7" to 30"x40", and prints/posters range from 8"x10" to 36"x48". Most are available unframed, but in-house framing options can be viewed at the gallery and on the website at the "Framed By Rhys" category. Shipping is available all across America. 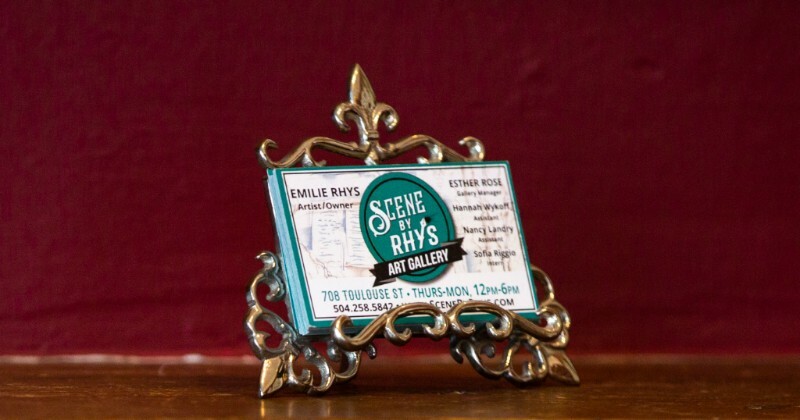 We invite you to take a look at the artwork available for purchase in person during regular business hours at the Scene By Rhys Art Gallery in the heart of the historic French Quarter, and 24/7 online in the website shop.